Quite frankly, I'm surprised that there are any cookies to show you today. I kind of inhaled a good portion of the cookie dough before baking it. So, I spied these mint dark chocolate m&m's at my grocery store, immediately snagged them, and tucked them away for St. Patrick's Day. 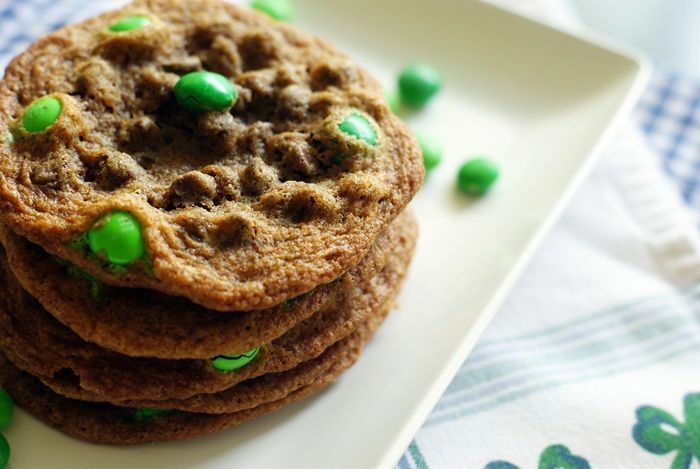 But, don't limit yourself to St. Patrick's Day, these are really perfect anytime...plus, with the mint, your cookie doubles as breath freshener. The cookies are BIG and thin, so they might look crispy....they're not. They're soft and bendy, and utterly delicious. Then, if you want to get a little crazy....you do, right? 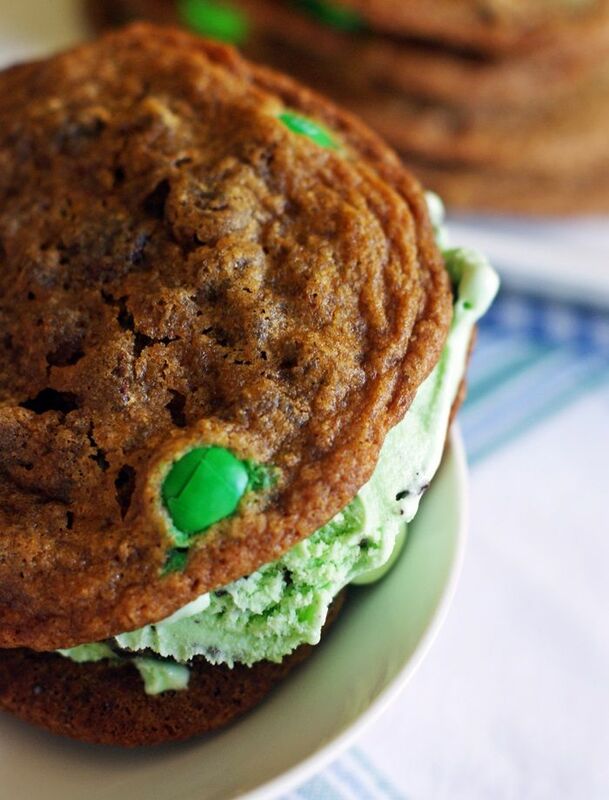 Break out the mint chocolate chip ice cream and make yourself a minty ice cream sandwich. Line 2 cookie sheets with parchment paper. Preheat oven to 325. In a medium bowl, whisk together the flour, baking powder, baking powder, and salt. Set aside. Beat the butter and sugars together until combined and fluffy. Add in the eggs, one at a time, beating between additions and scraping down the bowl as necessary. Beat in the vanilla. Add the flour on low in three additions, just until combined. Stir in the chocolate chips. Using a cookie scoop, or a spoon, scoop out about 2 TBSP of dough per cookie, leaving at least 2" of space between cookies. Press in 5-6 m&m's on the top. Bake for 12-14 minutes...the side will look done and the middles will still be soft. Cool on the tray for 2 minutes, then remove to a wire cooling rack to cool completely. If desired, sandwich around mint chocolate chip ice cream. Oooooo, these look like perfect cookies! And how cute with the green M&M's! LOVE this idea! so cute & clever. These sound fabulous...especially with ice cream in the middle!!! And now I'm dreaming about that pot pie. 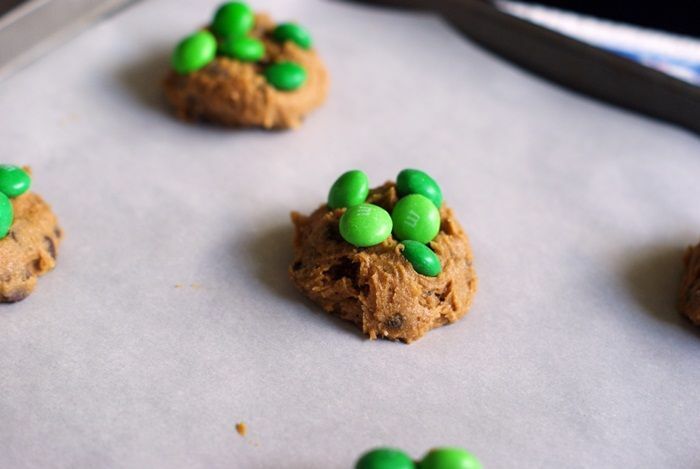 Perfect cookies for St. Paddy's day! These are perfect for St Patrick's Day! And using them to make minty ice cream sandwiches? Genius! These cookies sound fantastic, but in ice cream sandwich form... oh my! Time to hunt down those M&Ms!! These look so yummy! I love chocolate and mint and I love a good, crispy chocolate chip cookie. Great recipe, Bridget! Love chocolate mint and chocolate chip COOKIES... this sounds GOOD to me! OMG how I miss Blue Bell ice cream!!!!! I grew up eating it and then couldn't find it once I moved out of Texas. Ive had my eye on those M & Ms but have never picked them up. Now you have me convinced they are a must-purchase item. GREAT lookin' cookies! I love a thin, bendy, chocolate chip cookie myself. Adding the M&M's and creating an ice cream sandwich...great idea, especially with the ice cream you chose. Glad you had a great time in Seattle and with Teresa. It's kinda mean how you show off with your Blue Bell. The ice cream in these makes me swoon! these look awesome then you went and stuffed it with my fav ice cream. fabulous. I love everything about this post! The cookies look DELICIOUS!! The photos are beautiful. ADDING ICE CREAM? SUCH a fantastic idea!!! And the fact that it doubles as a breath mint? How could a girl say no?! Oh, yum! 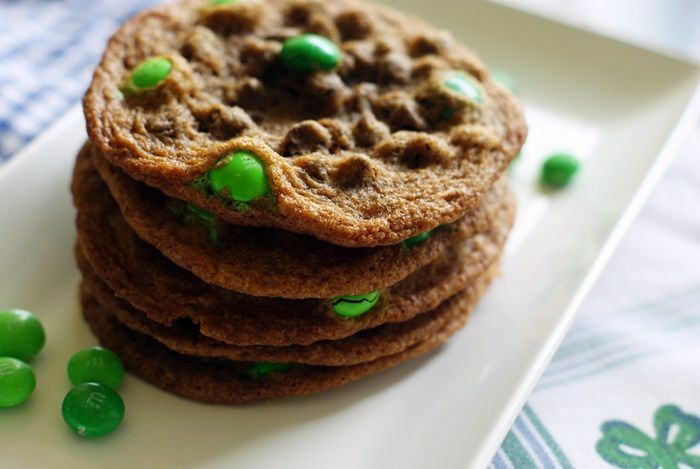 I kind of want to try this recipe with with Junior Mints... Off to the kitchen! oh my! can you pack one in a cooler to bring over tomorrow? i wish we got mint M&M's here in Canada! not fair! 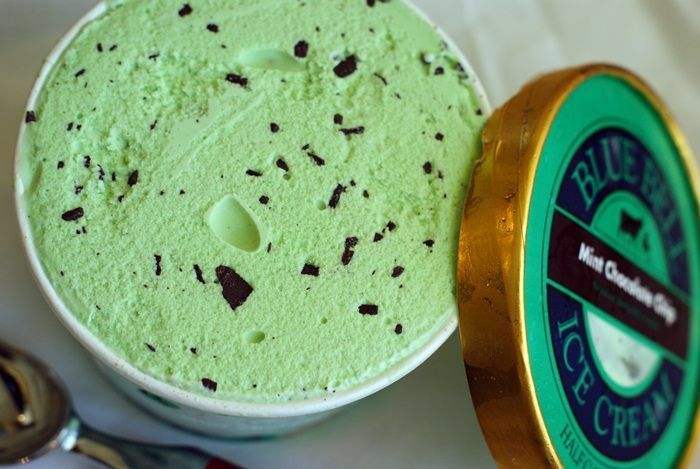 This is complete mint choc chip heaven! 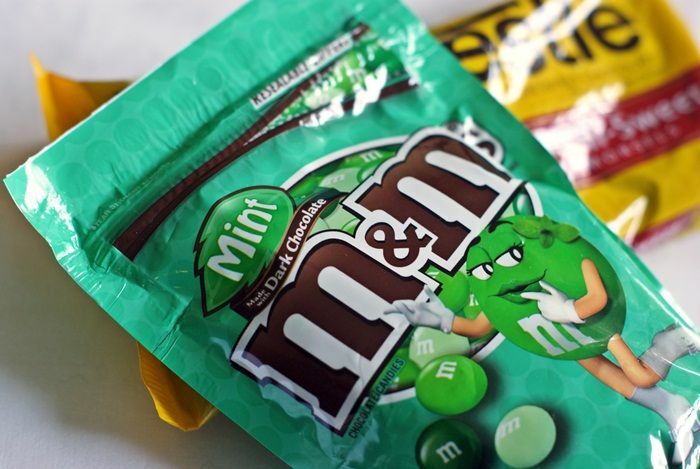 I don't think we get mint M&Ms in the UK which makes me kind of sad...going to see if I can order some online now! I've never seen mint M&Ms in the UK but YUM! Love mint everything. And cookies and ice cream? Excuse me I'm off to stuff my face to attempt to get rid this craving! I think I'd like to order, oh, say 5 dozen. Maybe 6? Awww am drooling. The icecream sandwich is so tempting!!! Mmmm, I want to eat these *right now*! They look scrumptious! I didn't think these could be any better til I scrolled down and saw you'd made them into ice cream sandies!